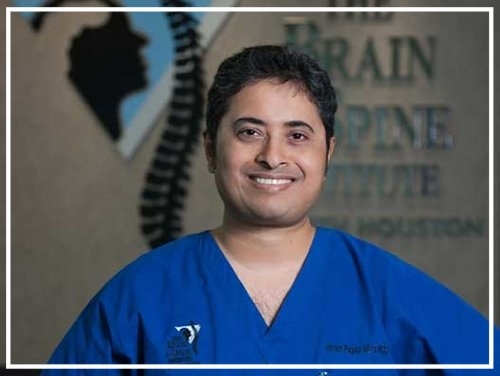 The Brain & Spine Institute of North Houston was established in 2009 by Dr. Imran Fayaz, originally from Ontario, Canada. Dr. Fayaz is a neurosurgeon caring for patients in the Houston-area at his practice in The Woodlands, Texas. He is an experienced, board-certified neurosurgeon who specializes in relieving back pain and neck pain for his patients. He helps patients with a wide variety of neck and back problems including surgical and non-surgical treatment of herniated discs, spinal stenosis, degenerative disc disease and other spine conditions. Dr. Fayaz is a communicator, both with his patients and with referring physicians. He believes that his patients deserve an accurate diagnosis and a realistic treatment and recovery plan. The majority of patients who come to him for neck and back pain can be managed conservatively and non-surgically. For this to be determined accurately, however, a thorough clinical and diagnostic assessment must be performed. During an assessment, the primary objective is to understand the patient’s symptoms and signs in the context of a comprehensive diagnosis, to then lay the groundwork for treatment. If back surgery or neck surgery is suggested he will help the patient understand all the options for treatment, both surgically and non-surgically. This requires a partnership with a team of other healthcare providers, which can include Neurologists, Orthopedic Specialists, Pain Management Specialists, Physical and Rehabilitation Medicine Specialists, and Therapists. Dr. Fayaz is proudly affiliated with HCA Houston Healthcare Conroe using the latest treatments and techniques for back, neck, brain and spine conditions using the Stealth Navigation System & O-Arm Imaging Device. These technologies combine intraoperative imaging & surgical image guidance to provide safe & precise accuracy for spinal procedures. HCA Houston Healthcare Conroe is proud to be one of two facilities in the North Houston area to offer patients this cutting edge technology. Dr. Fayaz completed his undergraduate education at University College, and obtained his medical degree with Honors from the Faculty of Medicine, University of Toronto. He went on to complete residency training at the renowned University of Toronto Neurosurgical Training Program, including training in Pediatric Neurosurgery at the Hospital for Sick Children in Toronto. During his residency, Dr. Fayaz completed research training in the Neurosciences as part of the Surgical Scientist Program, obtaining a Master of Science degree from the University of Toronto. This was followed by fellowship training in Neurosurgery at St. Michael’s Hospital in Toronto, with a special emphasis on disorders of the spine, skull base and peripheral nerves. Dr. Fayaz has authored many clinical and research publications in peer-reviewed journals. Request an Appointment at our Office in The Woodlands, Texas.